This was a typical lacy building in the city. This is a rather poor scan of some of the silk tatted into stuff. I am also working on a white collar, but it keeps twisting into a spiral, I will have to see how it works when I add in the second row. I am guessing the silk works out at around 40 or 50 size. The multi coloured bookmark is in 100 cotton from Gütermann, Rosie said it looked as if it had been commissioned by Google! Sorry for the mess of ends, especially as I have new needles and some excellent needle threaders, so no excuse not to get it all perfect! A lace embellished tree! Wow! I don't think I'd ever have thought of that! Guerilla Tatting! I ♥ it! LOL! You GO girl! I can't wait to see a photo of what will probably be planet Earth's first Guerilla Tatted tree branch or sign or whatever! LOL! I've seen several photos in different places where they embellished the town's fixtures or landscaping with needlework. Usually with yarn knitting or crocheting while this is thread. I have some rayon cord that would hold up well in weather but don't think I'd put my fine threads out like that. LOL! The trees are amazing! Who woulda thought? LOL! That tree is amazing. Hope you have a great Christmas. The tree is amazing. I've never seen anything like that. 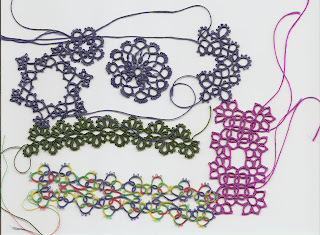 And I have to admit I have never heard of tatting before I read your blog. It sounds like so much fun! I might have to experiment with it. Thanks for sharing!